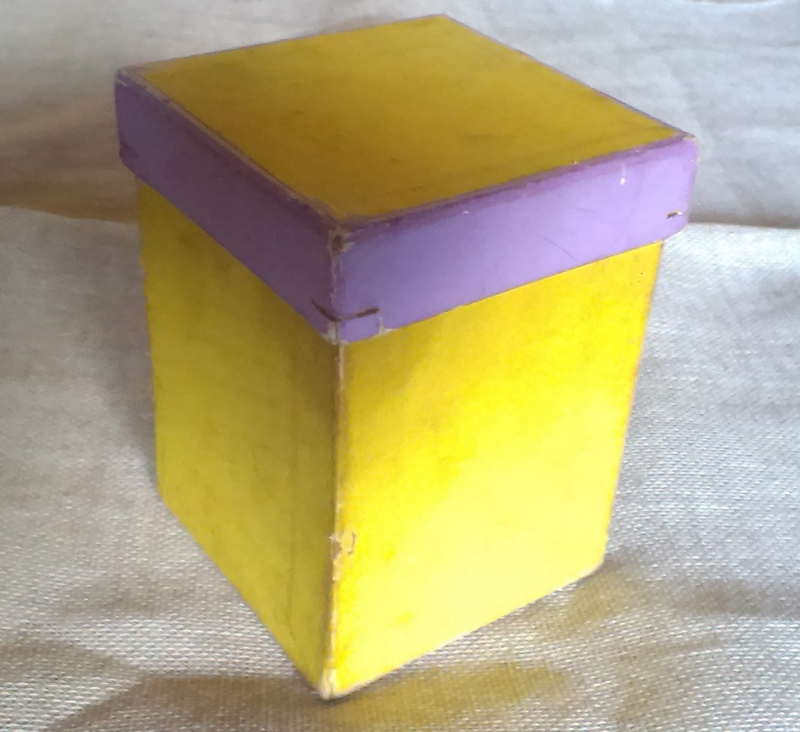 The other day, while I was looking for something completely different, I came across this little box which had belonged to my grandmother. Not very exciting is it. But then, what happens if you take off the lid and peep inside? …opened out, it’s obvious – a needle-case. Dozens of rusty (but still very sharp) needles. And what’s in the middle? 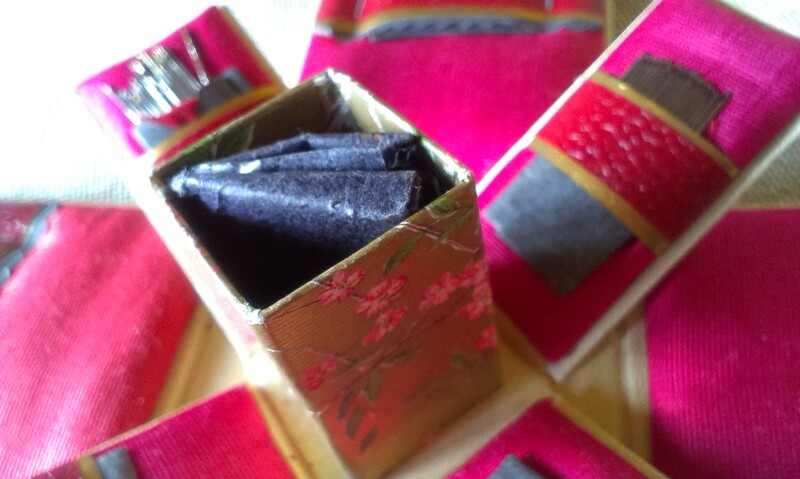 Just more needles – still wrapped in their black tissue. 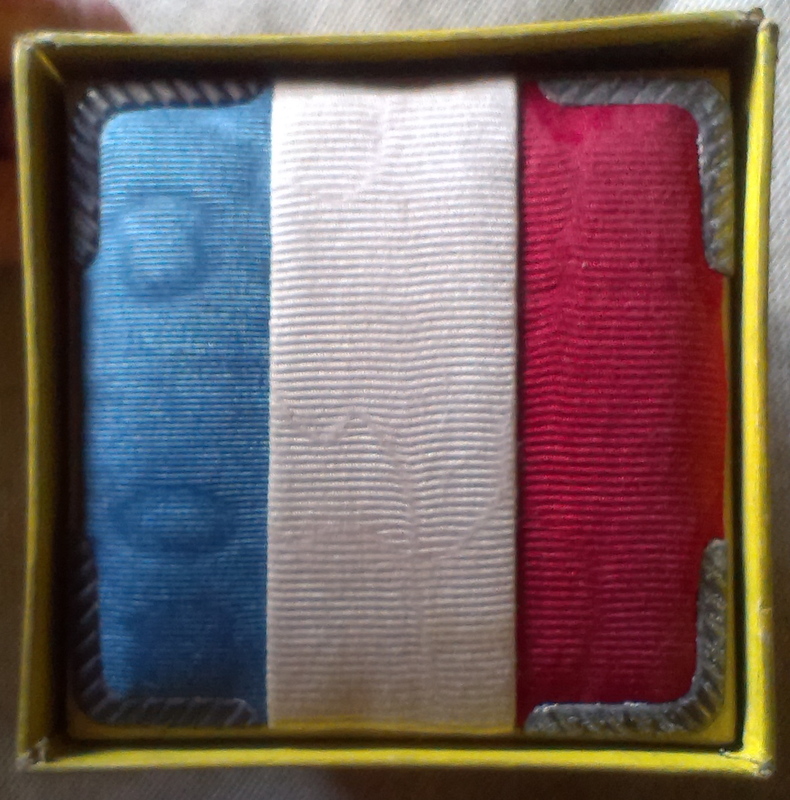 A gift to my grandmother from her brother, fighting in France during The Great War. (He survived). Not all family heirlooms are valuable, some are priceless. It really is! Nan treasured it always. Beautiful and as you say priceless – and still in such good condition. The outside is a bit grubby, but I suppose because it was never used, the interior is really lovely. One of the little packets of needles in the middle pot is still sealed. Oh how wonderful. My mum made me one years ago and i have no idea what happened to it. I think it was covered with a Laura Ashley print which dated it as much as yours is dated by its more poignant decoration. 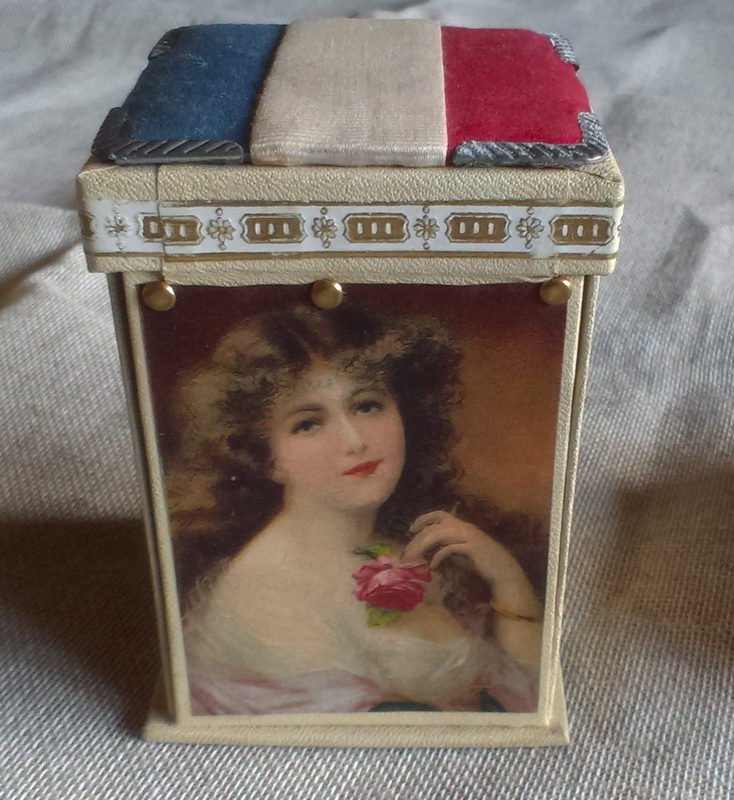 We have quite a lot of WWI stuff – postcards, trinkets etc and they’re interesting as an indication of popular taste – they seam to vary from extremely tacky to very nice indeed. Wow! What a find! And what a piece of history. I expect most families have a similar hoard, so many people were affected, but it’s good to still know its history. That is so beautiful. Something to treasure indeed. Oh what a treasure to have found, Anny. I’m so glad your great-uncle survived the war. My grandfather sent my grandmother a lot of embroidered greeting cards from the Western Front and they are treasured too. They’re wonderful things aren’t they. We have a load of them too and almost all written in pencil, which for some reason makes me quite emotional, thinking about the conditions they were written in – reading their little tender messages makes me very teary,- even though amazingly all our family survived, they didn’t know that at the time. PS – good luck with the move! What a fantastic thing to have. Its history makes it a real treasure, but as thing it’s lovely too. 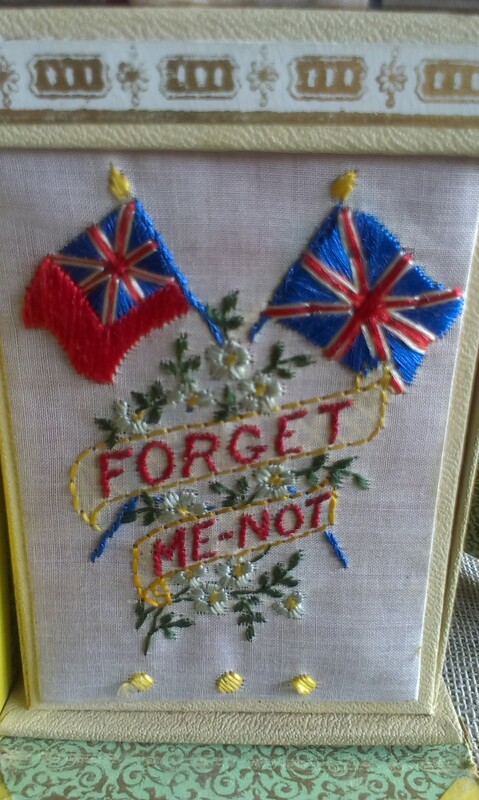 Do you think the forget-me-knot embroidery was part of it, or was it added? 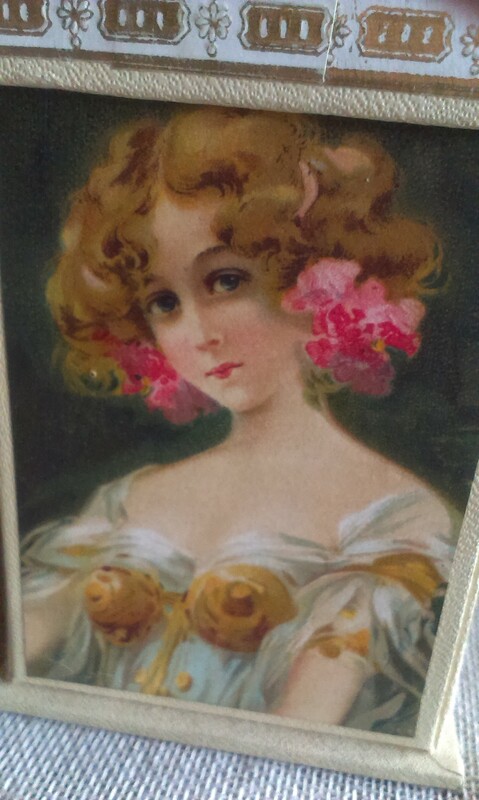 And the lovely ladies are rather marvellous – I love the gold bosom! It is lovely isn’t it – yes the embroidery is certainly part of the original box, there was a lot of this type of thing produced during the war, and embroidered postcards are very common from this period (in fact it was our postcard album from that time I was actually trying to find when I rediscovered the little needlecase). I think that perhaps the rather plain exterior has helped it survive – if it had been more decorated it might have had more little hands playing with it. I am indeed very lucky to have it. 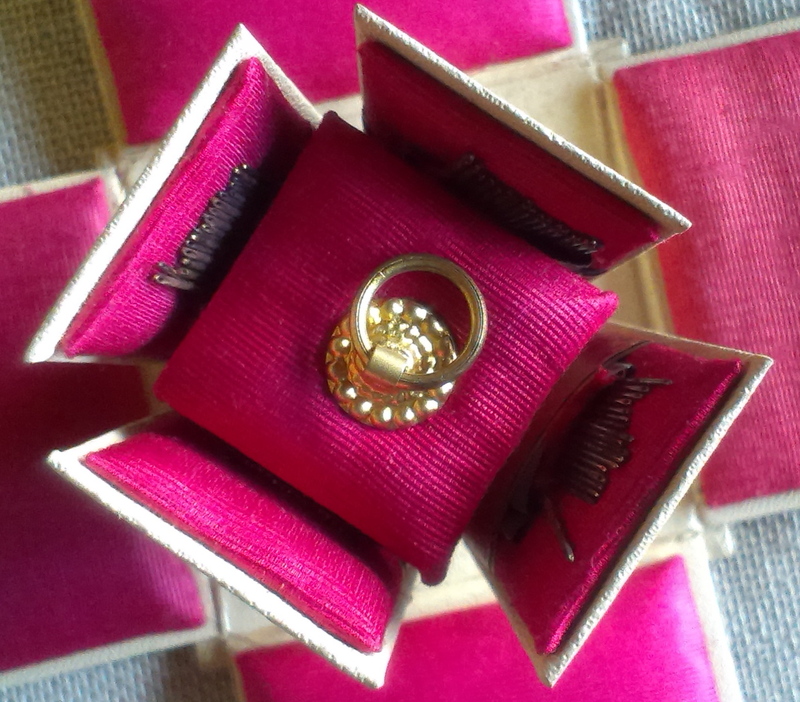 Actually what I think about most when I open it up, is sitting with my Nan when I was little and her showing me her treasures – it’s nostalgic and very tender. That is gorgeous. And the colours inside, so vivid. 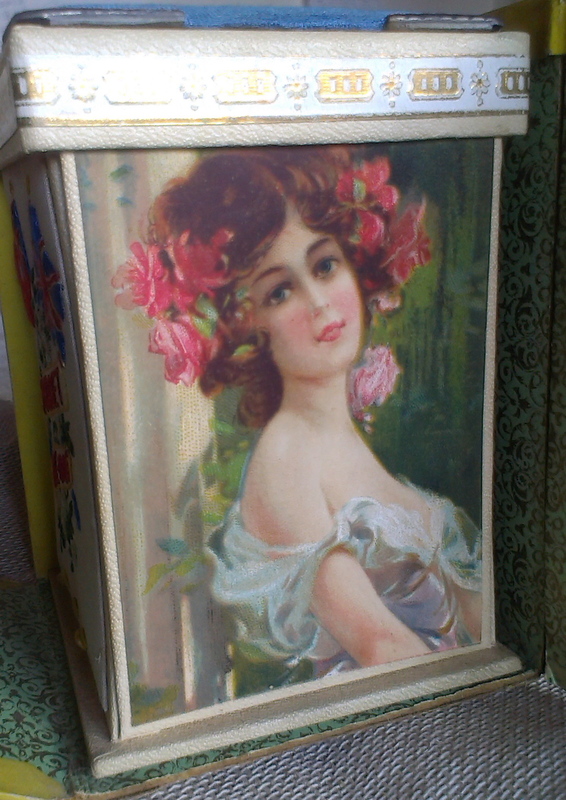 Peter and I have a very pretty painted sewing-box made for us by his sister Sally, full of drawers and trays. Ours is yellow too, though teamed with blue rather than lilac. We use it all the time to make repairs, and always think of her. 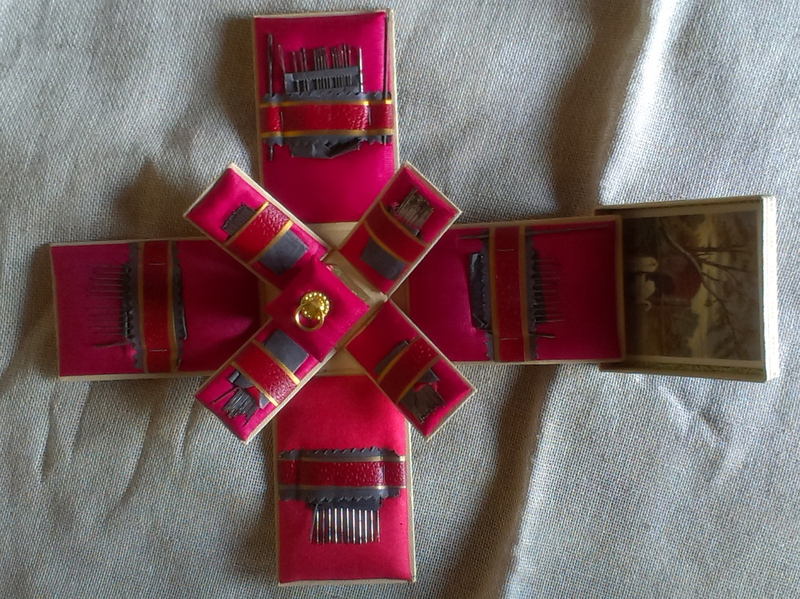 I also have a card beautifully embroidered with silk, originally sent by my uncle from France during World War I to his little brother, who became my father. There’s something so touching about these little pieces don’t you think – we invest a lot of emotions in them, which is why they end up meaning so much to us.